Oviya will soon start shooting for a film titled Silukkuvarupatti Singam which she has signed even before entering the Bigg Boss house. 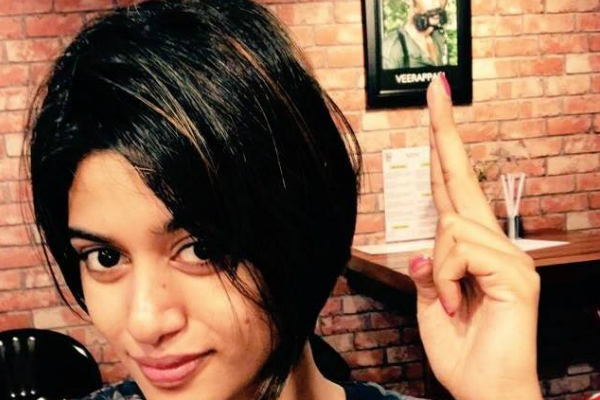 After walling out of the Bigg Boss Tamil show, Oviya Helen kept to herself most of the time and hasn’t spoken much on social media or any other forum. The actress, however, went through a makeover post coming out of the show and her fans loved her new look. Oviya has garnered so much following during her stint at the Bigg Boss Tamil show and has now become the most popular actress in Tamil. Oviya, today, for the first time posted a message on her Twitter page and her army erupted out of joy looking at their favourite contestant speak for the first time on social media. “At a loss for words, to describe the love 💖 & care from each one of you.. I feel blessed, thankful & to be more responsible for all ur love,” tweeted Oviya which saw so many responses and replies. Oviya Army, a popular group of fans of Oviya, filled social media with messages garnering with love and respect. Few fans even asked and requested her to come back on the show to seek vengeance but Oviya had clearly stated few days ago that she would not enter the show again this season. After her stint at the Bigg Boss Tamil show, Oviya now has resumed back to her routine and will soon start shooting for a film which she has signed even before entering the Bigg Boss house. The film, titled Silukkuvarupatti Singam, features Regina Cassandra and Vishnu Vishal in the lead roles, and will have Oviya Helen playing a cameo. Initially it was said to be brief role in the film but later it was made an extended cameo in the films, according to reports. Keep up the great work ! You have great potential. From Vani in Jhb. Miss Oviya is Indeed a Precious Diamond, Golden Gem.